bendable display Archives - Touch Display Research, Inc. Flexible display is at the turning point for fast growth. We can see this trend at SID 2016 DisplayWeek. Japan Display Inc. (JDI) showcased several curved AMOLED displays. Two of the curved AMOLED were in a glass box. Another curved AMOLED demo is integrated with a curved touch screen on it. E Ink showed large size flexible active matrix electrophoretic display. FlexEnable showcased flexible LCD for wrist wearable devices. 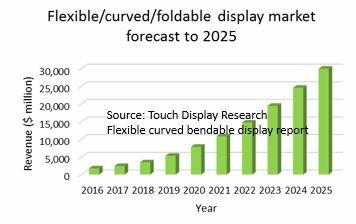 In the “Flexible, Curved, and Bendable Display Technologies and Market Forecast Report.” (Second Edition), Touch Display Research analyzed over 10 display technologies, over 14 applications of flexible displays, and shows how the flexible display market is accelerating. This report profiles over 270 companies working on flexible displays. OLED is the most researched with 46 companies and research institutes working on it. Touch Display Research believes there are strong opportunities for flexible LCD as well since it could be lower cost than flexible AMOLED. Touch Display Research forecasts that the flexible display market will reach $30 Billion by 2025. Flexible display could be used in four types of form factors: bendable dynamic, foldable dynamic, fixed curved, flat with flexible substrate. Currently, flexible displays are already shipping in large volumes. We forecast that flexible, curved and bendable displays will have tremendous growth in the next several years. Flexible, curved and bendable displays still face many challenges. Over 10 display technologies could be made into flexible curved bendable form factors. Challenges and opportunities are analyzed in the report. This entry was posted in Displays, Flexible curved display, Flexible OLED, Flexible touch screen and tagged bendable display, curved display, e ink, FlexEnable, flexible curved bendable display, flexible display, Japan Display, market forecast on June 9, 2016 by jennycolegrove.